Join Rivers of Steel at the Pittsburgh Glass Center on Thursday August 2, 2018 to meet this year’s selected artists for Alloy Pittsburgh 2018. 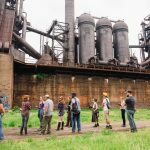 This informal meet and greet will include opportunities to hear from each artist and learn about their planned installations opening at the Carrie Blast Furnaces on August 25th. Alloy Pittsburgh invites members of the public to mix and mingle with the artists and enjoy complimentary drinks and snacks in The Hodge Gallery at Pittsburgh Glass Center. This event is free and open to the public. August 25, 2018. Opening Reception. Carrie Furnaces, 1-4pm. 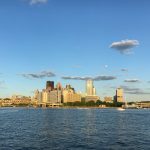 September 13, 2018 Alloy PGH Retrospective. Alumni and Public reception. Carrie Blast Furnaces, 630-8:30pm. September 29, 2018 Closing Festivities in Conjunction with the Festival of Combustion. Carrie Blast Furnaces, 12-5pm.